Navigating the country lanes on their way to view a remote farmhouse, Sally and Rob Appleyard couldn’t help but wonder why the estate agent’s details had no photographs of the interior. Find out how they completed the loving restoration, then see more of our stunning real home transformations. Find out how to renovate a house, too. Owners Sally Appleyard, who manages the property as a film shoot location (lidhamhillfarm.co.uk), lives here with husband Rob, a financial director, and their children Zack, 11, and Aggy, six. 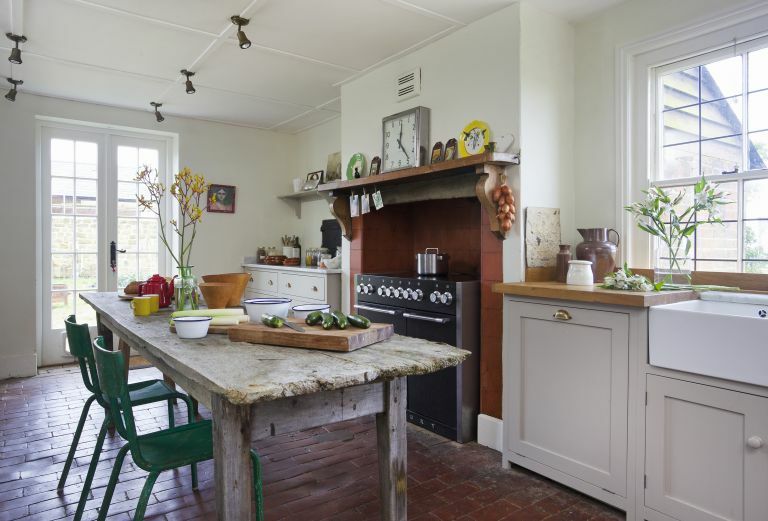 Property A Grade II-listed, 17th-century farmhouse, with Victorian additions, set in six acres in East Sussex. Essential repairs The couple installed a central heating system and the house was rewired and replumbed. A new kitchen, family bathroom and two en suites were fitted. The inglenook and chimney were restored, the walls were replastered and windows replaced. At that stage, in 2011, the couple made the brave decision to change their lifestyle completely and relocate from the Georgian home they had recently renovated in London. Reminiscing over holidays spent in and around Rye and Camber Sands, the couple started their search in East Sussex. They saw dozens of houses before happening upon Lidham Hill Farm, situated between Rye and Hastings. Unfortunately, purchasing the house took much longer than the Appleyards had anticipated, as they couldn’t find a buyer for their London home for more than a year. However, in October 2012, Sally and Rob finally moved in, wasting no time installing a large wood-burning stove in the living room’s impressive inglenook fireplace. ‘This was a huge bonus on two fronts,’ explains Sally. ‘Not only did the guy who fitted the wood-burner recommend a fantastic builder but, as temperatures plummeted, the living room and kitchen became the only rooms that were in any way warm. One side of the house was so cold that it became a complete no-go zone that winter. In the spring, the badly needed central heating was installed and the whole house rewired. After that, builder Richard Holloway and his team began tackling the first major project – knocking two of the bedrooms into one and fitting an en suite, as well as replumbing the entire property. The bed is an antique, but this guest room has a modern feel. A bright chunky knit throw from Toast is paired with an Eames rocking chair from The Conran Shop. Next, fitters from Devol Kitchens stripped out the tired old units and replaced them with smart cupboards, marble and oak worktops, plus a handy dresser. ‘The old Aga was full of plaster dust and totally inefficient,’ says Sally. ‘We swapped it for a Mercury range, with a good blend of both contemporary and traditional elements.’ Indeed, the Appleyards have worked hard to achieve a mix of period and modern styles throughout this welcoming house, packed with antiques, curios and personal touches.